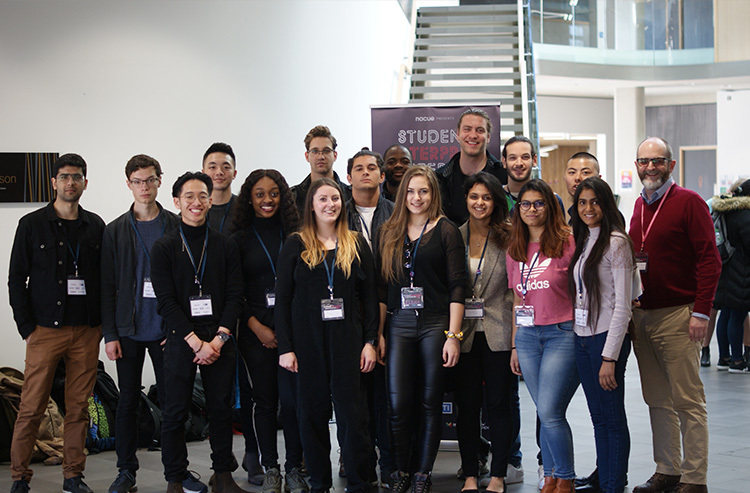 The 10th Annual National Association of College and University Entrepreneurs (NACUE) conference took over the Sibson Building the weekend of the 23 & 24 February, offering students an immersion into the world of entrepreneurship and start-up business. Kent Business School Dean, Professor Martin Meyer, welcomed delegates to the conference. More than 400 delegates enjoyed some 25 unique talks, workshops and panel discussions over the weekend, which was run by NACUE and hosted by KBS’ ASPIRE, welcoming international speakers and students from 28 universities across the UK. The conference’s ‘Change Makers’ theme aligned with Kent Business School’s (KBS) mission of sustainable innovation and developing employable, ethical and responsible graduates, as well as managers and leaders who make a difference. Speakers and experts covered topics from leadership to investment, marketing to networking. They explored issues such how to inspire ethical future leaders and the value of disruptive business models. High-profile speakers included the founder of Wildhearts, Dr Mick Jackson, co-founder of Monzo Bank, Jonas Templestein, and Paul Forkan, co-founder of ethical fashion brand, Gandy’s. Among the experts and speakers were Kent Alumni returning to share their experience including Amy McManus, MD of AM Marketing, Oliver Salisbury from Seedrs, Alex Souter of Fat Lama and Joseph Aina, founder of JMArt Space. Joseph and Oliver are both alumni of our flagship entrepreneurship programme, the Business Start-Up Journey, which is run through ASPIRE. Students on this year’s Journey were amongst those who showcased their businesses over the two days, gaining valuable experience, feedback and sales! Students from the Kent Marketing Society and Enactus Kent also joined the conference, leading a workshop on leadership, communication and team work. The weekend was extremely successful with praise from the organisers, speakers and delegates for KBS’ facilities, welcome and focus on entrepreneurship and sustainability. Learn more about NACUE and the support offered to Kent Business School students by ASPIRE.